Please find below a list of handy hints, links to things we use and like, and common questions in our FAQ pages. If you are an owner of one of our bikes or have any of the components on this page, we hope these short little videos will be helpful to you. We always welcome a phone call, but you may find the answer to your question here - please have a browse through. Careful riding could be a mistake – The problem of slowing tandems on long downhills. Imagine the situation: On holiday, touring on a tandem, you are half-way down a long 1 in 7 slope descent and you can smell that the brakes are starting to get hot. There’s still a way to go to the bottom so you decide to play safe and brake firmly to bring your speed down from 35 mph, or more, to a very “conservative” 15 mph and you sit at that speed until you reach the bottom. Good decision? The answer is emphatically “NO!” – you have unfortunately just made a very bad choice and significantly increased your chances of overheating the brakes and crashing due to an inner tube suddenly deflating as it overheats and melts. It may seem to go against common sense, but at the lower speed of about 15 mph the brakes will get hotter than at 35 mph. So, on the downhill you already had hot brakes, you heated them a lot more by slowing down, and then chose a speed more likely to lead to brake overheating. It felt like the right thing to do but it was not a good choice. This article will try to explain why. Question 1 – where is all this heat coming from? As you go downhill the energy due to your height above sea level is turned into kinetic (speed) energy as you speed up, and into heat energy as you control the speed. The heat energy is in three parts: wind resistance (yes, this does heat up the air very slightly), brake heat, and a very small amount of friction in the bearings and tyres. The energy lost on a descent is simple to calculate: the mass of the bike and riders, multiplied by gravity to get the weight, and then multiplied by the height lost. [Mass and weight are not the same: the mass of a tandem is the same on earth and on the moon, but the weight is different since the gravity is different – the stored potential energy depends on the weight, not the mass]. So the power that has to be dissipated as heat (power is the amount of energy in a given time) is proportional to the weight, the forward speed and the steepness of the slope. If you want to calculate this it is best to work in the metric system to avoid results in ‘British Thermal Units’. Apologies to fully “metricated” readers for including mph and slopes as “1 in 7” but for British readers these are generally better understood. To convert: speed in mph, multiplied by 0.44 gives speed in metres per second. Power = 150 x 9.8 x (35 x 0.44) x 1/7 = 3200 watts Over three kilowatts - more than an electric kettle! At 15 mph (about 7 m/s) the total power reduces to 1400 watts, still more than one of the heating bars on an old-fashioned electric heater. Since a tandem and crew weighs about twice as much as a solo bike and rider the power is twice as much, though obviously some very heavy riders on a well-loaded bike will weigh as much as a light tandem and crew. Heavy solo riders should be aware of these brake overheating problems as well. If you don’t use the brakes on a long downhill then you will eventually reach a maximum speed limited by wind resistance. This speed depends on the steepness of the slope, the weight of the loaded bike and the wind drag. Engineers usually abbreviate the total wind drag to CdA (Coefficient of drag, multiplied by effective Area). Wind resistance is very complex to calculate and it is necessary to make some estimates and assumptions in order to make calculation possible. It is generally correct that the retarding force due to wind resistance increases with (approximately) the square of the speed. This means that the power dissipated increases with (approximately) the cube of the speed. (Why? Well… energy equals force multiplied by distance, so power, which is energy in a given time, is the same as force multiplied by distance in a given time. But distance in a given time is speed, so power is the same as force multiplied by speed. And since it is already known that the wind resistance force is related to speed squared, this means power lost due to wind resistance is related to speed cubed). Wind Resistance measurement. Andy Blance of SJSC did a series of “coast-down” tests on known hills on a Thorn tandem. This gave a fairly repeatable calculated CdA of about 0.64 (plus or minus about 0.12). Even with a wind tunnel it is hard to get precise figures, especially with cyclists wearing loose flapping clothing (not that Andy would ever be so inappropriately dressed when out on an Audax ride). Rainer Pivit has done a lot of work on CdA (see reference above) and reports a CdA of about 0.79 for a cyclist sitting in an upright position using flat handlebars while wearing loose clothing and about 0.39 for a solo cyclist in a conventional full racing position using dropped handlebars and wearing a race jersey and tights. The irregular shape of cyclists produces a lot of drag. A typical modern small car has a Cd of about 0.34 and an effective frontal area of perhaps 1.8 m2 – the resulting total wind drag for the CdA of about 0.61 is less than a recreational tandem team! It is hard to believe at first that a small car can have lower wind resistance than a solo touring cyclist – but the car manufacturers have spent millions of dollars, euros and yen researching how to minimize overall drag - and the irregularities that make a huge difference to wind drag. Cyclists are very “irregular” shapes – both overall and also in terms of bulging pockets, pannier straps flapping in the wind, wrinkles at the elbow and knee of loose clothing and so on. Modern cars have such details, for example, as flush-fitting windows to eliminate the wind drag caused by the small protruding rubber sealing strips. 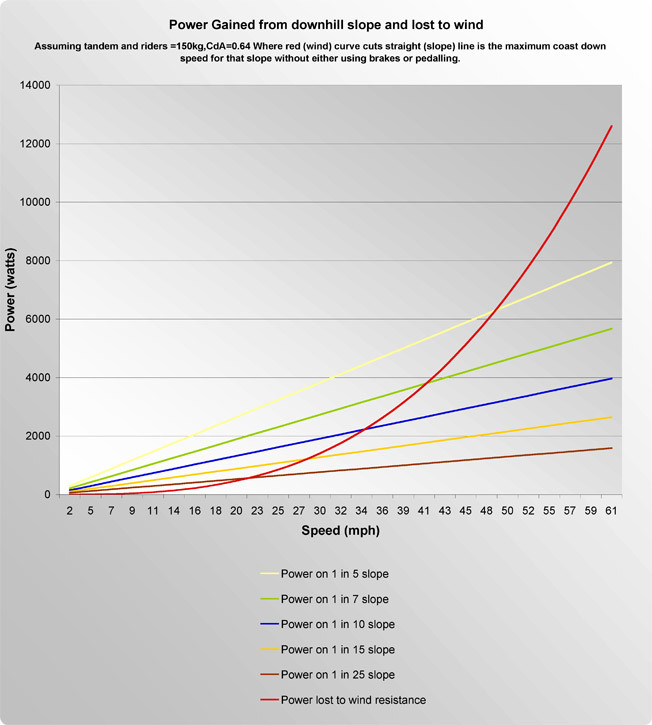 So, even on a relatively gentle 1 in 10 slope the maximum continuous brake power will be over 850 watts at about 9 m/s or 20 mph. That’s a lot of heat to get rid of. If the 850 watts was used to stop the tandem from 20 mph on a level road it would take seven seconds to come to a halt. The energy from descending hills is a far more serious heating problem for tandems than reducing speed or stopping. As slopes get steeper the heating increases – on a 1 in 5 slope it could be well over 2000 watts. The next graph shows the heating effect for the same tandem team on different slopes. On the graph above the blue curve shows the amount of power dissipated as heat in the brakes on a 1 in 10 slope. At very slow speeds there is not much wind resistance so most of the slowing is done by the brakes, but at these low speeds there isn’t all that much power to get rid of as you are not gaining energy quickly from descending. As speeds increase the brakes have to work harder and harder until the “worst” speed at which the brakes get hottest. Above this speed wind resistance starts to have a greater influence. As wind resistance now does more of the work of slowing the tandem, the brake power steadily decreases to zero again at the “maximum freewheeling speed” where wind resistance does all the work of slowing the bike. 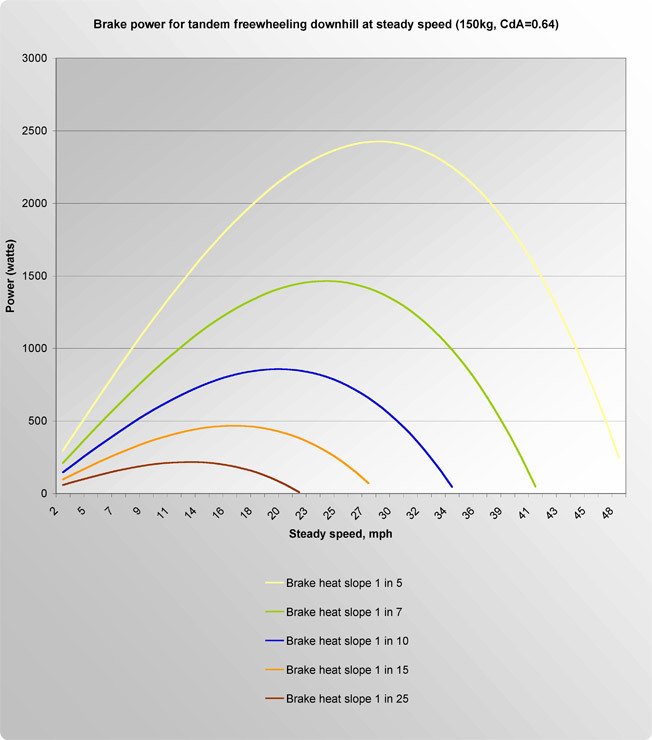 The “worst” speed, for hottest brakes, is in this example about 20 mph when the brakes need to dissipate over 850 watts. Note that the brake heating drops off slightly more quickly above the “worst” speed than below it. You are freewheeling down a 1 in 10 slope, using your brakes to slow you to nearly 30 mph (13 m/s). You realise that your brakes are getting hot so you slow down to 15 mph (about 6.6 m/s). That in fact increases the continuous brake heating by over 50% from 505 to 786 watts. Add to that the kinetic (speed) energy you just dumped into your brakes by slowing down – equivalent to an extra 940 watts during ten seconds of slowing and the problem becomes clear. There is even another small effect to add to this, the slower you go the less cooling breeze there is for the brake disks or wheel rims so the heating effect is slightly worse. The “moral” of the story is clear – cautious descending at a medium speed is the worst choice. Ride fast to make wind resistance do the work – and brake sharply just before any corners like a racing rider. If you think your brakes are too hot for safety then either stop and wait for them to cool (the best choice) or ride at a walking pace while they cool (but that really means a walking pace, not a fast jog). Slowing down (or speeding up) by just a small amount won’t make much of a difference to the overheating. If you look on the graph you will see that a large change in speed is needed to get from the “worst” speed to either the higher or the lower speed which will significantly reduce the heating effect. The thermal mass (a measure of the amount of heat that can be stored) of a wheel rim is considerably more than a brake disk. Also, the tyre and inner tube are very good thermal insulators (like double glazing) and cover nearly half the rim. This means that the temperature where the rim touches the inner tube – which in the experience of Andy Blance is the failure point – can continue to increase for a while even after stopping, and will take a while to cool down. Pouring water on the rim (or disk) can be an effective way to increase cooling. The difference in thermal mass and area exposed to the air means that brake disks usually cool down more quickly than wheel rims. Below is a table of “worst speeds” for our example 150kg, 0.64 CdA tandem team, riding on a windless day. Remember that heavier teams and following winds make the problem worse. The speeds at which the heating of the brakes is reduced to half the maximum are included to show the large change in speed needed to get the brake heating to decrease by 50% – these are not “guaranteed safe” speeds. These speeds are not evenly spaced above and below the “worst” speed, but spread further below it due to the rapid increase in wind resistance as speed rises. If you are able to go faster than the “worst” speed then you will get a cooling effect – but a large (and possibly risky) increase in speed may be necessary to get significant cooling. This table also makes it clear that if you can get down a steep slope safely by careful riding then gentle slopes are not going to cause too many problems no matter what you do – a 1 in 7 slope will heat up the brakes about twice as much as a 1 in 12 slope. NOTE: These figures are based on a single illustrative example and use a lot of assumptions, they are indicative only to try to help with understanding the problem, they are not to be taken as definitive. The figures have been rounded to two digits as greater precision is not justified by the assumptions. If the all-up weight of tandem, crew and luggage is more than 150kg then the heating effect should be increased proportionally. Tandem brakes need to be able to dissipate a lot of heat for riders who want to control speeds on long steep descents. It seems unlikely that lightweight disk brakes or rim brakes could safely dissipate the power generated by prolonged braking down a 1 in 7 slope. A traditional drum “drag” brake (in addition to the two rim brakes) is able to dissipate safely a lot more heat than a disk brake. The problem is usually far more severe for tandems than for unloaded solo bikes; this is due to a tandem and riders having roughly double the weight of a solo bike but only slightly more wind resistance than a solo bike. (Of course there are extreme cases of very heavy solo riders with a lot of luggage actually weighing more than a sleek tandem team – in this case the solo rider should also consider fitting a third brake and riding to minimize brake heating). The demands on the brakes may however, in practice, be significantly more than double for a tandem compared with a - normally loaded - solo bike for two reasons. The reduced wind drag per person of a tandem means that the tandem is likely to be moving faster in normal riding in addition to its extra weight. Braking has in the past been provided by using a third brake, usually a hub drag brake, which was able to dissipate at least twice as much heat as a standard rim brake. When the third brake is a standard lightweight disk brake this extra heat dissipation may well not be possible without risking overheating the disk. There have been reports of overheated brake disks expanding, deforming and jamming in the caliper – with potentially disastrous consequences. Seriously overheating rim brakes leads to inner tube thermal failure and sudden deflation of the tyre. This is also a potential cause of a serious accident. Stopping a tandem, while obviously requiring good brakes, does not present the same heating problems. Stopping uses a larger force, but for a much shorter time, than a controlled descent. In fact not much force is required to overheat the brakes provided it is applied steadily for a long enough period of time – the continuous brake retarding force for our example tandem on a 1 in 10 slope that produces 850 watts at 20 mph is only about 100 newton (about 10 kgf or 22 lbf). Even on a 1 in 4 slope at 30mph, producing over 3 kW of brake heat, the retarding force is under 250 N (25 kgf or 55 lbf). These are very modest forces compared with the weight of the bike and riders – and especially when compared with the overall loading when a wheel hits a bump in the road. They are also much less than the maximum brake force required to be able to stop in a short distance during normal riding. • By always avoiding slowing to a “conservative” speed of perhaps 15 to 25 mph thinking this will help reduce brake heating on a downhill. Such slowing will probably make any overheating problems much worse. • The “racing descent” style of riding, with brakes off except to reduce speed for corners, generates far less brake heat overall than steady descending and should be used where practicable. If it isn't possible, then ride slowly and keep a check on how hot your disk brakes and wheel rims are. • If the brakes on a tandem are too hot then stop and wait for them to cool. Pouring water on the rims will help cooling. The problem only exists in hilly country with long descents. In this case having at least three brakes and keeping one brake cool for necessary stopping during a descent would appear a wise precaution. We have pulled together some useful links for anyone interested in touring on their bikes - having a bit of adventure or just some armchair research. This page shows you our last 6 posts on our facebook page. Please click on the icon on this page to follow us or read more. We would love to have you join us!